Discussion in 'Android Tablet News' started by dandroid, Jan 8, 2010. 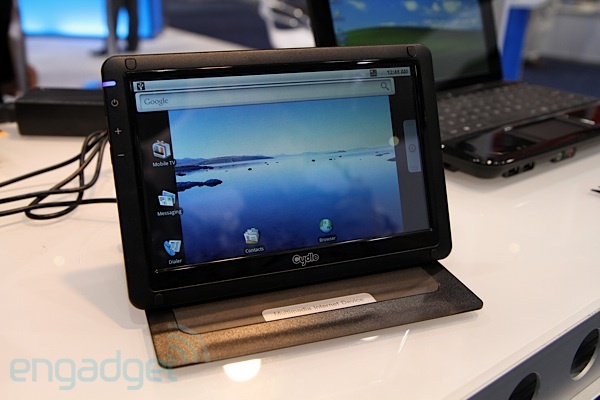 Cydle's M7 isn't the best tablet we've seen this year. In fact, it's hardly even a tablet -- it has a built-in stand that allows it to stand at attention in either landscape or portrait mode. When not in use, the stand actually flips around and acts as a screen cover -- which is a little comforting when thinking about this soft 7-inch resistive touchscreen bumping against sundry objects in a laptop bag. The Android software on the device right now is ultra beta, so we weren't able to see the internal ATSC TV tuner in action, but it does set the $199 device apart from some of its slate brethren, though our favorite feature might actually be the simple ability to use this device as an extra PC monitor. You know... it's the little things in life. Under the hood there's an ARM11 processor at 800MHz. The M7 should be launching in the Spring, and you can check out some video of the unit after the break if you're into that sort of thing.